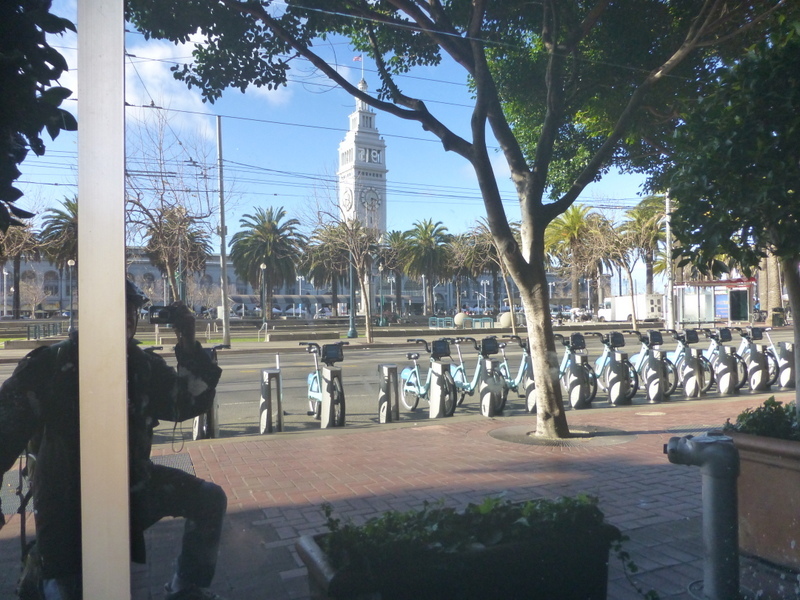 New restaurants are sprouting like high tech startups in San Francisco now, but i already have so many favorites that i haven’t tried any new ones since my last food column. Well, except for lunch today, when Mark took me to Griddle Fresh on 24th Street. 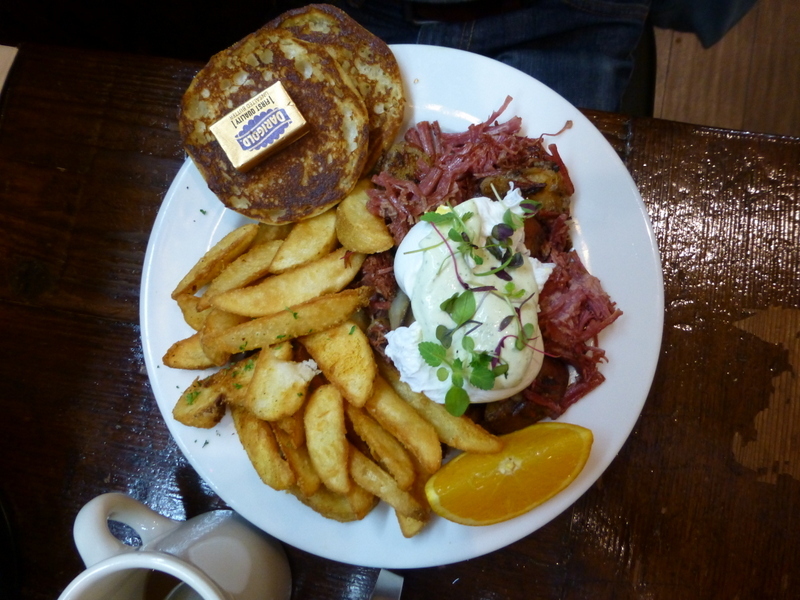 He had the corned beef hash with poached egg, and the taste i took was probably the best corned beef hash i ever ate although, since that’s not a favorite dish, i wouldn’t order it for myself even though the fries accompanying it were excellent. 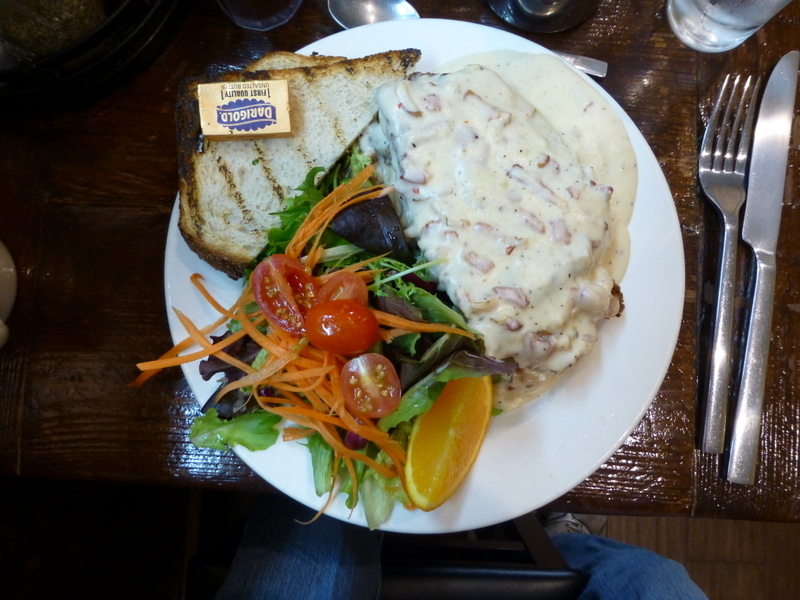 I was seduced by the fried chicken special on the cover of the menu, and it turned out to be two rather large breast filets pounded flat, heavily breaded, seriously fried, and smothered in a very rich gravy with lots of bacon in it. Whew. Fairly good is as high as i’ll go, but i’ll return to try one of their several Benedict variations. Their forte seems to be the pancakes, which read off the menu and looked on the neighbor’s table to be superb…and to contain a week’s worth of carbohydrates in one dish. And yes, speaking of carbohydrates, i buy sugar (both brown and white) in 25 lb. bags for my jams/jellies/chutneys/marmalades and for chocolate sauce, which is so popular that it’s snatched up as fast as i can make it. Much of my output goes to my favorite vendors at the farmers’ markets, and i’ve discovered that what most farmers really love, although they certainly enjoy products made from the fruit they’re hip deep in, is something they don’t grow….like a cacao bean product. I eat almost none of the jams i make, and although i certainly love it, i consume only the chocolate sauce contained in the last, partially full bottle at the end of every batch. But oh, my love of sweets is so great that i have to grit my teeth to pass San Francisco’s fine bakeries, patisseries, confiseries, etc. And just yesterday morning after i’d bagged up a dozen of those fabulous, healthy, nearly extinct, old sour Marsh grapefruits at Hamada’s and was killing time until St. Benoit yogurt opened, i swung by Alfieri’s to get some nutritious low-carb almond butter and foolishly, foolishly took the proffered sample of a new product – a salted dark chocolate almond brittle. It was so delicious that i couldn’t resist buying the smallest bag, which i swore i’d ration out over the next week. It didn’t last the day. The first line of defense is at the store. Hell, that’s the only line of defense. Oh, and one day last week i got a haircut, which would have been a lo-carb experience except that Lisa, my wonderful Vietnamese barber, is located next door to a shop on Castro called Hot Cookie that sells, guess what. So i had their milk chocolate chip, whole Macadamia nut delight which, even though it’s so thin that the nuts stick up, is four inches in diameter. The only thing that saves me is that experiences like these take place about once a week rather than every day.